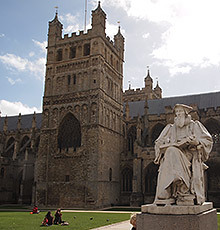 Originating as a Roman fort, built at the start point of the ancient Fosse Way (a major Roman road running north to Lincoln), Exeter has now grown to become a strategically placed cathedral city. The Romans built a wall around the town in AD 200, since which the, Saxons, Danes and Normans have occupied it, each adding to the fortifications. In fact William the Conqueror laid siege to the town, during the winter of 1068; the only remaining stronghold in England following his victory at Hastings two years earlier. The remains of the original Roman wall are still visible today, most prominently around Southernhay. A 12th-c tower still stands at the northernmost corner of the wall, at Rougemont. Near to which is the original gatehouse of the castle built by William the Conqueror. 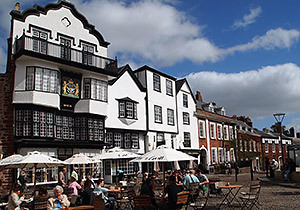 Exeter's Cathedral Yard is a delightful area to visit at the heart of the busy city, with old Elizabethan houses, shops and restaurants, overlooking the spacious lawns around the magnificent Norman Cathedral. The Guildhall, the centre of Exeter's civic life for over 800 years, claims to be the oldest municipal building in the country. Its roof, restored in 1469 during the Wars of the Roses, displays the Bear and Ragged Staff badge of Warwick the Kingmaker. Many of the city centre's ancient buildings were destroyed during air raids in WWII. One that survived is St Mary Steps Church, on Stepcote Hill, which has a clock on its wall in which the hours are struck by three figures, known locally as Matthew the Miller and his two sons. Much of Exeter's prosperity in medieval times came from the trade that passed through its quay on the river. In 1290, the port was cut-off by the construction of a weir across the Exe, 3 miles south of the city, by Lady Isabel the Countess of Devon. In 1564, Exeter commissioned England's first ship canal, which eventually brought some trade back to the city. Exeter's Maritime Museum (once located in the canal basin near the quayside), sadly closed in 1997. The majority of its exhibits (from a Welsh coracle to Brunel's steam dredger 'Bertha'), were transferred to 'World of Boats' at the fishing port of Eyemouth on the East Coast Scottish Border. The two great square castellated towers are the main surviving parts of the original Norman construction, which rise gracefully above its transepts, dedicated to St Peter the Apostle. Founded in 1050, the cathedral was rebuilt in its current form around 1270 to 1360. The west face supports one of the largest surviving arrays of 14th century sculpture in Britain. Inside, the 60 ft (18 m) high, oak Bishop's Throne (circa 1313), sits beneath the longest stretch of 13th century Gothic vaulted ceiling in the world. It notably contains some of finest decorated Gothic architecture of any Cathedral in Britain and well worth a pilgrimage. The unusual astronomical clock on the north wall of the transept was provided by Bishop Courtenay, in 1484, along with the 5 ton tower bell. The Castle stands on the highest part of the city, to the north-east of the city walls. The reddish colour of its volcanic rock foundations gave it its current name: 'Rougemont Castle'. Not much remains of the early Norman buildings except for the entrance gatehouse. The castle is now privately owned and run as a venue for art exhibitions and music events. The Red Coat Guides give free 90 minute tours of Exeter throughout the year, except Christmas Day and Boxing Day. Tours start from the Royal Clarence Hotel in Cathedral Yard or from the Quay House Visitor Centre. A City Wall tour is also available, which lasts 2 hours. Exeter's oldest municipal building still in use today. Built in 1330, with later modifications. Contains portraits of several local dignitaries, guild crests, civic silver and other rich regalia. Located by the River Exe, Quay House (circa 1680) was built to store woollen cloth and other goods for transport along the river and canal. Contains a small museum dedicated to the history of the quayside, including several audio-visual presentations explaining Exeter's history from the Roman era onwards. Contains several galleries of local history displays from pre-history to the present day. Also hosts Exeter's art gallery and largest exhibition space. Dating from the 13th century, these underground passages once transported the city's water supply from springs, at the head of the Langbrook Valley, outside the city walls.